The BJP is hoping to cash in on the mutual hostility between the ruling coalition partners at the grassroot level in several constituencies. He lashed out at the Deve Gowda family, targeting the JDS supremo’s son Chief Minister HD Kumaraswamy over his reported remark that only those who cannot get two square meals a day seek jobs in the services, terming it an ‘insult’ to the armed forces. He also hit out at Gowda’s other son and minister HD Revanna, without naming him, for his remark that he would retire from politics if Modi was voted back to power. The Prime Minister is addressing back to back rallies in Karnataka, where the BJP has targetted to win 22 of the 28 Lok Sabha seats, riding on what it perceives as a “Modi wave”. BJP is also hoping to cash in on the mutual hostility between the ruling coalition partners at the grassroot level in several constituencies. The BJP won 17 seats in the 2014 polls. The Prime Minister said the 2019 election is between Rashtrawad (nationalism) and parivarwad (dynasty). “The election was between nation first or family first,” he said. “In Karnataka Congress and JD(S) are signs of Parivarwad. Both parties that have lost touch with the people are that much connected to their families…Their only mission is commission,” Modi said. “When there was Congress government, there was Mr 10 per cent. Do you remember Mr 10 per cent? Now they have joined together 10 per cent is theirs and other 10 per cent of others. Now Karnataka is going on with 20 per cent,” he said. In his campaign during the May 2018 assembly polls, Modi had attacked the then Siddaramaiah dispensation as a “10 per cent commission government. The Prime Minister said he had seen media reports yesterday of Kumaraswamy saying that those who don’t get food two times a day join the Army. “What kind of thinking is this Kumaraswamy ji? You cannot escape by saying that your statement has been wrongly interpreted. You have said what is in your heart,” Modi said. “…is it not an insult to our brave soldiers and armed forces…will you seek vote on this? Those who serve the country and ready to sacrifice for it facing all odds…Such words for them, such thinking. Doob maro doob maro (die drowning), those who insult the country’s army,” he said. Modi said such people could not understand the “tapasya” of the Army as they were born with a silver spoon. Those who have remained in power for three generations could never understand the poor and their dignity, Modi said. “This is the thinking with Congress and JD(S) and their mahamilavati (adulterated) dal…. (they) dont give importance to the countrys security,” the Prime Minister said. 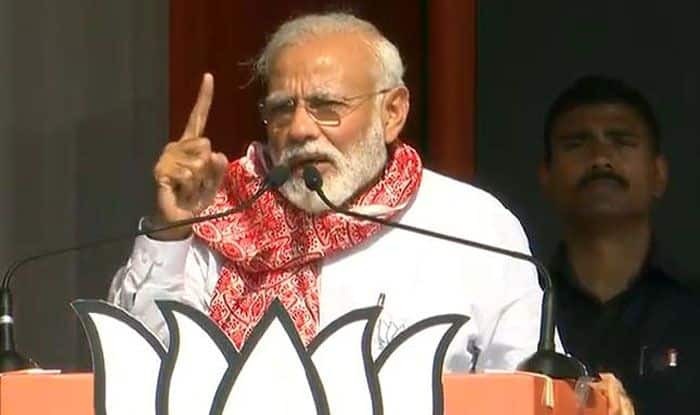 Accusing Congress and JD(S) of being against “Rashtrawadis” and those protecting the country, Modi said they don’t feel ashamed in standing with those shouting slogans ‘Bharat tere tukde honge’ and dream about it. “They have money for Sultan’s utsav, but have shortage of money to remember Hampis pride,” Modi, said referring to the state government’s controversial celebrations of “Tipu Jayanti” on November 10 every year in memory of Tipu Sultan, the 18th century ruler of the erstwhile Mysore kingdom. He reminded the crowd that in the 2014 elections, Deve Gowda had himself said that if Modi won and became the prime minister, he would take “sanyas”. “Did he take sanyas? Did father (Deve Gowda) take sanyas? Will son take sanyas? Leave sanyas, they are giving tickets to those remaining in the family,” he stated. “Wherever I have had the opportunity to go across the country, phir rk baar…” Modi said, to which the public roared in unison “Modi sarkar”. “This is the voice of the people across the country. There is a wave that is going on. Your love is spoiling the sleep of those sitting in Delhi,” he told the surging crowds. Modi stopped his speech four or five times as the crowds continued to swell and surged forward chanting “Modi, Modi”. “Till now we were hearing about Congress’ involvement in defence deal, land deal, submarine deal, helicopter deal. Now they are looting the plates of innocent kids. Congress is hungry after remaining out of power for five years…Congress’ sin cannot be cleared,” he added. Madhya Pradesh Chief Minister Kamal Nath’s residence as an MP is at 1, Tughlaq Road in New Delhi, while Congress president Rahul Gandhi’s official residence as an MP is 12, Tughlak Lane in the national capital.